One Girl In The Kitchen: Squash, Bell Pepper & Coconut Milk. Thai Inspired. Squash, Bell Pepper & Coconut Milk. Thai Inspired. Soup. One more time. Again, orange. Again, squash. This time though, no butternut squash. Instead, I chose a kabocha, which may sound like a bad word, but in reality it's the name of a Japanese squash, small (well....of course, it's Japan style), round and very sweet. I'd even say that to me kabocha is no doubt the perfect squash, the real Cucurbita Maxima, the Rolls Royce of all squash. Stuff that'll make all Cinderellas out there red with envy. My weekly soup is somewhat Thai inspired. Just as I've already experimented here, I started from a base of Thai curry paste, this time red, to which I added extra ginger, lime and lemongrass, just to make sure that the Thai effect be nice and strong. Place cut squash on a baking pan lined with parchment paper, sprinkle with salt and pepper, and bake at 400 for about 45 minutes, until squash is soft. Peel it, cut the flesh in small pieces and set them aside. Meanwhile, roast bell pepper on the stove, peel it, discard seeds and white parts, and cut it in pieces. Heat some olive oil in a large pot, sauté the chopped onion, about 2 teaspoons of curry paste (the exact amount depends on how spicy and hot the curry is, it's better to start with 1-2 teaspoons, and then add more at the end, if necessary), a small piece of fresh ginger, grated lime peel, and some chopped lemongrass. Cook for few minutes, until curry paste has dissolved, then add the vegetables. Pour in coconut milk and lime juice, bring to boil, and then puree everything with an immersion blender until soup is nice and smooth. If needed, dilute it with some more water and add a little more curry paste. 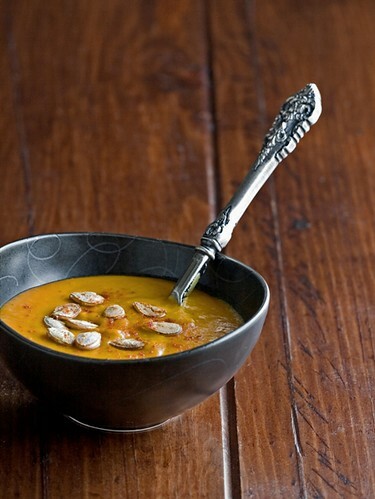 To serve, sprinkle each bowl with a handful of roasted pumpkin seeds.